Have at least 200 words in your newsletter even if you are only sending a link for them to download a PDF. A link all by itself will generate spam score with a lot of the spam filters out there, so having 200+ words will have you covered. Never have more image content than text content in your message. The PDF file option can be as image-heavy as you like, but the actual mailing you send to your list of subscribers should follow this rule. Test your links before you send your e-mail. A single broken link in your message will give it a very high spam score with any of the spam filters. Do not include special punctuation marks such as exclamation marks, asterisks, percentile signs, pound signs, etc. in your Subject line. Such punctuation will give you spam score in the filters. You are safe to use hyphens, periods, commas, ampersands (&), and colons and semicolons, if you must. Do not use quotes or double-quotes in your subject line: they can be mis-perceived as html or other types of code. 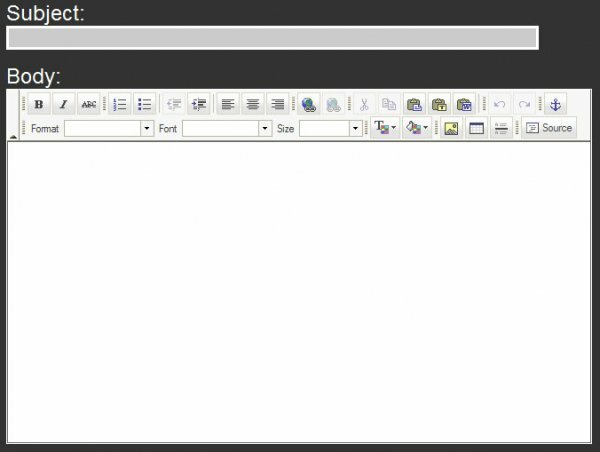 When you copy and paste from an external source into your Content Editor (the Body section, below), make sure to use either Paste as Plain Text or Paste from Word (the two buttons to the right of the normal Paste button in the top row of buttons in the Content Editor). This will clean out unseen markup and code that your newsletter does not need and that can cause potential problems with the way it displays and possibly even the spam filters. Do not paste anything into the Subject field or other such fields throughout the system: make sure to type your information in there to avoid the same problems. Begin by planning your newsletter carefully. It is better to focus on one main theme and give a few short, hard-hitting offers (if your newsletter is for online retail) than to provide a broad variety of written material. Click here for an article by a professional online marketing specialist on what makes a good e-newsletter. Click here for a second example. After you've planned what you will write, compose your message. If you will be composing your message in our Email Marketing module, click here for the next step. If you will be composing in another program, read on. MS Word, MS Publisher, and Adobe InDesign are good programs in which to build an e-newsletter. Don't write a book. Your subscribers are looking at an e-mail, not a printed page, a magazine or a newspaper, so keep your message short and to the point. Follow the rule of three: Divide your page up mentally into nine squares. Have your content fit nicely within those squares: you might have a banner image running across the top three, a product you're promoting in the first square of the middle row, a brief marketing message about the product in the center and right side boxes of that row, and then the bottom three squares could be blurbs about events you have coming up. 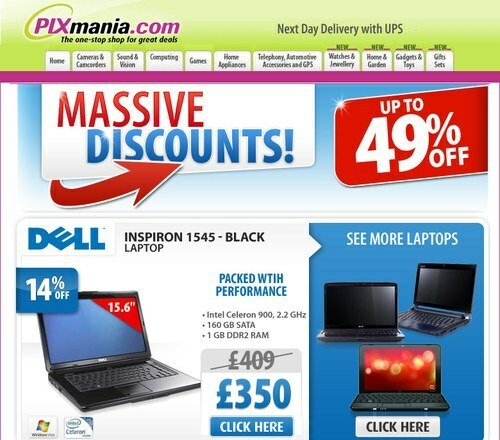 Click here for some visual examples on what works for online retailers. Keep the important stuff 'above the fold'; if possible, keep the whole message viewable without any scrolling. If you need your message to be longer than about half a printed page, make sure that the key content is at the top, above the fold, so that your subscribers are almost certain to see it. Don't forget your prerequisites: if you have any images in your newsletter, you need at least 200 words of text in your message as well. Huge online retailers can bypass that requirement because they pay big dollars for services that let them do so: you don't have that kind of money (most likely) so make sure your text gets in there. Big online retailers can get away with image-only mass e-mails: little guys can't (unless they want to pay big money for it). Make sure you have adequate text content in your messages (at least 200 words). If you want to go the most spam-safe route, you should save your highly graphical eNewsletter as a PDF and then create a link in your mailout that your subscribers can click to download the file (see Mass Mailing Your Newsletter, Step #3 below). If you are working in Word or Publisher, you can do this directly from your File menu (File > Save As > PDF - In the options be sure to specify PDF for Web for the smallest file size). 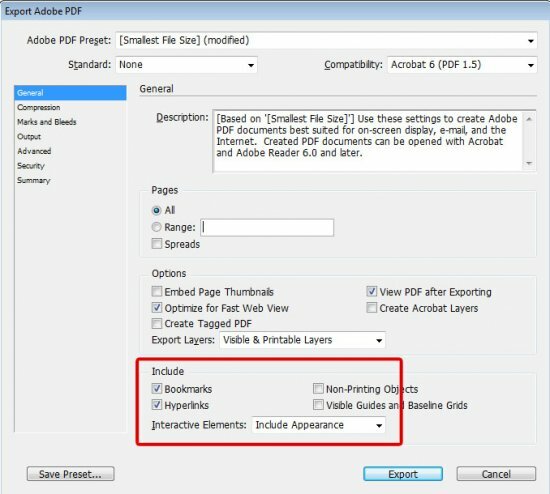 InDesign can also save directly as a PDF (File > Adobe PDF Presets > [Smallest File Size]). 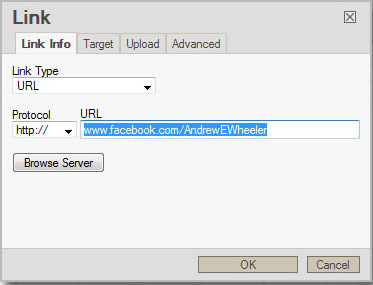 Be sure that when you create your PDF you enable your hyperlinks, if any, in the PDF preferences window. The screen you see like the one to the right may not look exactly like this one, but should have the same options. It will come up for you after you've clicked a Save button to save your document as a PDF. If you are using a different program from the three listed, check the File menu under functions such as Save As or Export or anything that mentions PDF, because it's likely the software can save directly as a PDF. In cases where you cannot save as a PDF, see Step #4 below. If you have no way to save your document as a PDF, there are a couple of free alternatives for you. You can go to Zamzar.com, create a free account with them, and convert your document (from almost all formats) to a PDF (see top image to right). Another choice is to go to pdf995.com and download free software that will let you print to PDF (it prints a file instead of to a normal printer) and/or that can give you the ability to convert documents in most formats to PDF. To download this software, click the Downloads link in the menu bar at the top. While all of their tools work well, for producing PDF files, you really need only the Printer Driver and the Converter (see right). In our experience these utilities are excellent, but please understand they are not our products so for any support issues you will need to contact PDF995. After creating your free account at Zamzar.com, go through the 4 simple steps to convert your document. You will be sent an e-mail with a link to download the converted file. After going to PDF995.com, click on Downloads and download the printer driver and converter above. After installation, you will have a new 'printer' installed in your system that will not print to normal paper but instead will create PDF files, so you will be able to do so by using your Print function and selecting the PDF printer. The converter will let you convert saved document files directly to PDF files. Once you are ready to get into your website and actually send out the newsletter (or compose it within our system, if that is how you are creating it) follow the steps below to send it through our Email Marketing system. 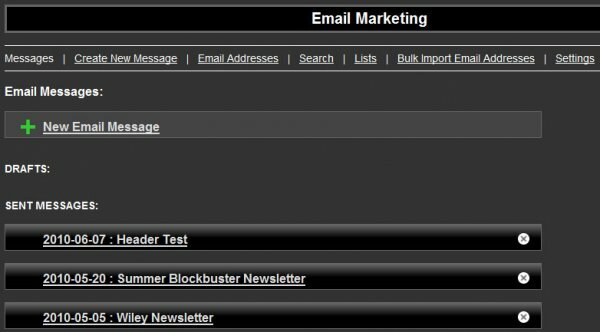 After logging into your website, go to Manage Modules > Email Marketing and click on either Create New Message or +New Email Message (the functions are identical). In the Subject line, enter the title, if any, of your newsletter. It is good to inject your personality here with some kind of appealing line: email is a fast-paced medium and your subscribers will quickly decide not to even view the message if the subject line is not intriguing. Make sure not to use exclamation marks, asterisks, or pound signs in the subject line (your message will be flagged as spam). In the Body, if you are just sending out a text newsletter, your message can be whatever length you like. If you are including one or more images, make sure your message has 200 words or more so it doesn't get flagged as spam. If you are linking a PDF file for your newsletter, follow the instructions in #3 below. To save your work, click the Save Draft button at the bottom of the screen. Enter the name of your Newsletter in the Title field, and then click Browse to search your computer for the file. Click once again on Repository and find the file you uploaded. Copy the URL beneath the file name (you will use this to create the link). You should create a simple sentence to turn into the link (e.g. 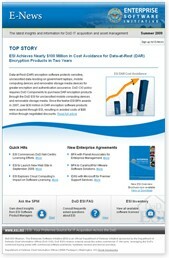 Click here to download our April Newsletter!). 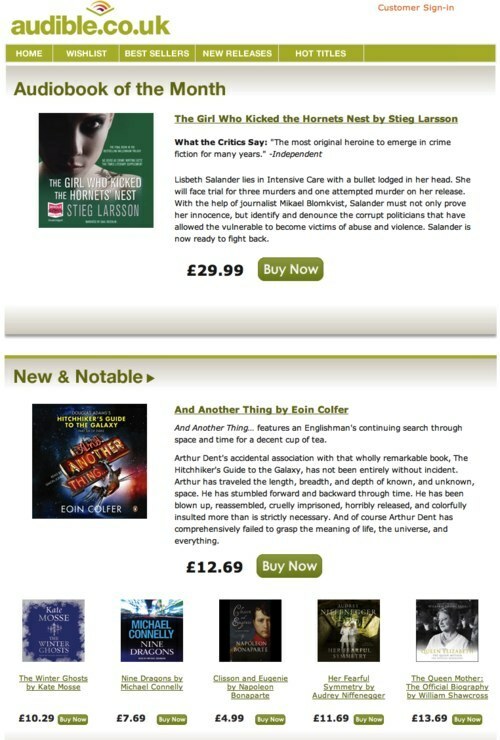 Highlight the sentence with your mouse, and then click on the Insert/Edit Link button (see second image to the right). In the URL field, paste what you copied from the Repository. 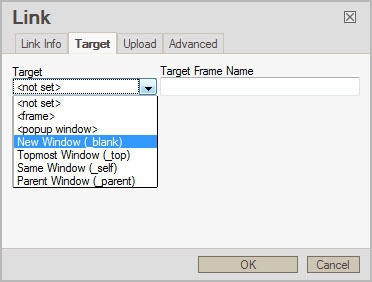 Click on the Target tab, then click the drop-list for Target and select New Window. Make sure you test the link by opening a new browser window and pasting once more what you copied from Repository. The file should load for you in your browser. If you need help setting up the layout of a newsletter you compose in our editor, please give us a call at Support and let us help you 1-on-1 to set it up how you would like it. There are so many different ways to set up your message, there is no way to cover all of them here. Our toll-free Support number is (877) 909-6699. If you keep an archive of your Newsletters (our system can automate this for you), check the box to save it to your Newsletter Archive module. Click the checkbox for the Email List you want to send it to. For almost all of your mailouts, you will not need to send a test e-mail. The only time you might want to do so is if your message has several images and less than 200 words of text. If you send the test e-mail and it does not go through, you need to increase your text content and possibly decrease your image content. When finished, click the Send button. As mentioned before, if you are not ready to send it out yet you can save it as a Draft and come back to it later.